Guilford Plastic Surgery | Financing | Beth Collins, M.D. We accept several different forms of payment for your convenience as you cover the cost of your plastic surgery in Guilford and New Haven. A fast, easy, convenient application process that can be completed from anywhere in just 2 minutes! 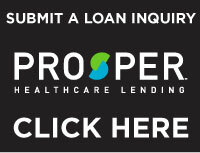 Click here for more information on Prosper Healthcare Lending and call us to today at (203) 689-5295 to begin your journey to looking and feeling better! To learn more about CareCredit, please contact us or call (203) 689-5295. Click here to apply!